Alter Egos spotlights an EHS student or staff who has a hidden, awesome talent; who has interests that lie off the beaten path; or who has had a life experience that others would benefit from hearing. It interviews Pioneers who are becoming the best version of themselves in order to inspire others to follow suit. In the third installment, I sat down with Sebastian “Seb” D. (‘17), an accomplished rescue diver, to tap into his knowledge of the field and the lessons diving has taught him. I’m from Bermuda. It’s 21 square miles, has got 60,000 people, and is a subtropical island. Most people think we’re in the Bermuda Triangle, and we get eaten by monsters. I work at Tucker’s Point Diving Watersports during vacations. We do two dives in the morning, and one in the afternoon. You don’t have much of a life if you’re a professional diver. It’s seven days a week, twelve hours a day. Everyone is cool, though, very laid back. Until something happens, then they all snap into gear. Because if the instructors mess up, people can die. You have to have that switch. With technical diving, you’re either breathing or you’re dead. Tell me about the sites where you dive. There’s the Cathedral, the most famous site in Bermuda. It’s a massive swim-through that has holes in the top of the reef and light filters through, you can fit like two boats in it, it’s insane. There’s a memorial there, a block with a lighthouse and a big anchor for a guy who died a mile away. He was using a rebreather for the first time, without a buddy, and didn’t check his air, then he blacked out and drowned. We go to another site that only we go to, called Ben’s Bender. It’s made of coral, algae, and worm-dung. You swim through a corkscrew channel that comes to a fork: if you’ve used a lot of air, you can take a left and go back to the boat; but if you’re with more experienced people, you can take a right and go through an arch and two more swim-throughs before getting back to the boat. We also take groups to wreckage sites. There’s one called TheKate, which is 200 feet long--we think it was that long because there was a tax if your ship was over 201 feet, ha ha! You can see the propeller and anchor. There’s another one called the Pelinaion that ran onto a reef. The story goes that the navigator and captain got into an argument as to how close they were to Bermuda. Because it was during World War Two, there were blackout conditions, and Saint David’s lighthouse wasn’t on. So they ran into the head. The ship is pretty intact: the bow is on the top of the head, and you can swim down under it and see all the engines and turbines. No, everyone got rescued. But the captain lost his license. The only site I know where someone died was where an American bomber crashed. They were testing an experimental engine, and it crashed. The pilot died, but a ship came out and took the engine but left the body. I think it wasn’t until years later that they came back and got the body. But that one is cool because the plane is well-preserved; you can see the propellers and wings. You are also dive rescue certified. What’s that process like? The first one to get is Open Water, then Advanced Open Water, and after that Rescue Diving, Search and Recovery, and Deep Diving, which is over sixty feet. The last test, oh man. There’s two parts. First there’s Emergency First Response. So you have to know how to do first aid stuff, like splint arms, heal wounds, and CPR. Then there’s the dive component. You have to know how to use emergency oxygen, how to assess what’s wrong with someone, and perform the rescue itself. So you have to learn how to find someone, get them up without narcosis or bends, but the hardest part is giving rescue breaths every four seconds while you strip their rescue gear before getting them on a ship and continuing with CPR. Have you ever had to use your training? We had one bad experience with this guy. We were in the Cathedral. On the way out he was bragging about how good he was at diving, about his gear being the best. But we were swimming through the Cathedral when this guy’s inflater hose burst, over-inflating his BCD (buoyancy control device). It shot him to the top, against the roof--he’s lucky he didn’t hit his head, just his tank. So, the biggest thing in diving is to never hold your breath, because if you do, all the nitrogen bubbles get in your tissues, and if you go up too quickly while you aren’t breathing your lungs can expand and burst. Then you’d die. This guy panicked. He takes off his BCD, takes out his regulator, which lets him breathe; then he takes off his mask, which let’s him see; kicks off his fins, which gets him places; keeps his weight belt on, which causes him to sink to the bottom; then he walks out of the cave, takes off his weight belt, and shoots to the top! We had to get him on emergency oxygen. The only thing that kept his lungs from bursting was luck. But other than that, diving is lots of fun. I used to play baseball with Chris Ricca ‘17, in Bermuda. He came here, and I saw him on a picture on the website, which was pretty cool. I took a tour, and I liked the facilities. All the buildings are close together. Everyone seemed pretty nice. Last year was my first year. It was different, learning how to get myself organized. After getting the hang of that, it’s just homework and hanging out with friends all day. Who are some teachers you look up to? I like Mr. Kanozek and Mr. Blais. 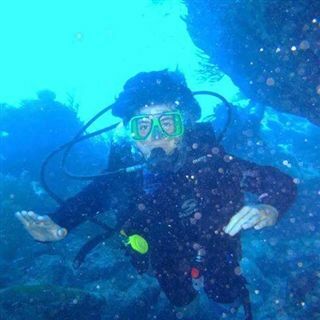 Mr. Ward, my advisor, does a lot of diving. We’ve talked about putting together a diving trip, but there are some safety issues we’d have to work out first. This summer back in Bermuda we taught a kid who had autism how to dive. It was awesome being a teacher and seeing him get over his fear, and exploring the ocean. Next summer, I’m traveling to New Zealand to get my snowboard instructor license. Then I’ll go to university for special education. I’m applying to schools in Canada, like the University of Western Ontario and Wilfrid Laurier in Waterloo, and in the US the University of Denver. Once I graduate there, hopefully I’ll be snowboarding and diving around the world! I’ll have my snowboard and my oxygen tank, meeting new people and finding new places. Seb and I talked for almost an hour, and we barely scratched the surface of what he knows. Beneath Seb’s affable nature and chill demeanor, there lies a depth of knowledge, capability, and fortitude that will serve him well in and out of the water. He has proven that he can survive and thrive in difficult situations with little margin of error; saving a life, after all, puts the stresses of school in context. With that confidence in himself, Seb’s path will take him anywhere he wants to go.